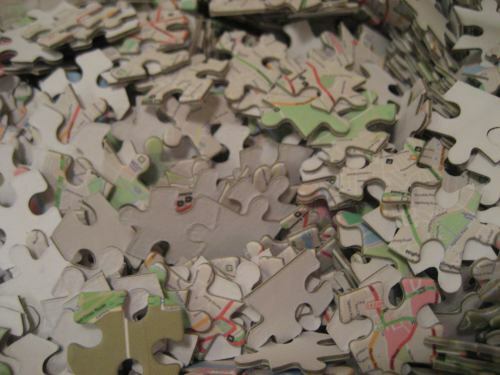 There’s a bunch of different sites for ordering custom jigsaw puzzles. 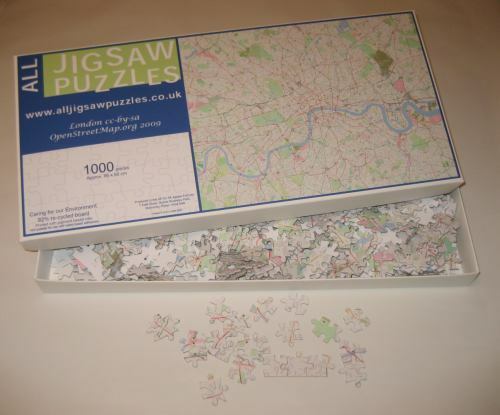 Obviously the normal thing is to use one of your own photos, but how about a jigsaw map? ….open licensed of course. A map could be a cool image to use on a jigsaw puzzle, because its a nice intricate image, with evenly spread complexity (compared to some photos at least) and it becomes a puzzle of geographical knowledge rather than just colour matching. I’m pretty pleased with the result. It comes in quite a nice box. The box and the jigsaw pieces themselves are with a papery finish, not gloss (maybe less durable) The text of the road names came out a bit on the small side. I think the fuzziness you see in the photo is actual fuzziness of the printing rather than camera blur, so yes the text would definitely benefit from a few more pixels, but hopefully it is not too painful to read while doing the puzzle.I knew that this was a danger as I prepared the image. An interesting “feature” of AllJigsawPuzzles.co.uk is that, despite a deluge of information on there, it doesn’t tell you much about what kind of image you’ll need until after you’ve made a credit card payment. In fact the image upload page is available with all this information, but you’re not linked to that until after paying. Even then it doesn’t actually tell you what pixel dimensions to go for, but you can work it out. The information is: “If possible save the picture at around 300 dpi (dots per inch), that is the resolution we work at. If you crop your picture before sending it, then try to have the picture size in the ratio of 25:19;”. The printed image is 26 x 20 inches, so it’s recommending 7800 x 6000 pixels. Now I sent a slightly lower res image at 7168 x 5448 pixels. To be honest I’d already faffed around a lot with the image at this size, before reading the instructions on this page, and I couldn’t be bothered to re-do everything. But also I figured they were probably erring on the high side at 300dpi, and I knew the text size was going to be an issue. If I’d sent a larger image (covering a large area of map) then the text would have printed even smaller. Of course what I should have done, is generated the map image myself, using a custom Mapnik stylesheet with larger text for printing. I notice Holger Schöner has some nice examples of this: ‘Mapnik maps for other resolutions’ on his demo page. But I was too lazy, so I used the BigMap perl code which creates a big image by tile stitching. I did actually use a custom CloudMade style with no buildings and no residential grey patches showing. This was because the coverage of these things is irritatingly incomplete at the moment (I organised a special mapping party to tackle this back in September, but there’s still a lot of work to do on that) and it would have annoyed me to have these problems showing on a jigsaw. You can follow a similar approach to me using BigMap. To get you started, here’s a suitable BigMap URL for Boston, however you have an additional problem for this city. 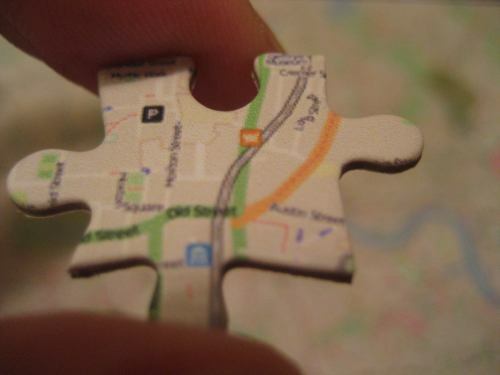 It’s characterised by its coastline, so you’ll end up with lots of blue jigsaw pieces for the ocean. You’d need to post-process the image with some tricks e.g. graduated fill, or gridlines or something to make the ocean part of the puzzle easier. Thank god! I have been burning through puzzles for years and have almost exhausted the list at Jigsaw puzzles in Canada. Custom puzzles sound like a good way to feed my habit.